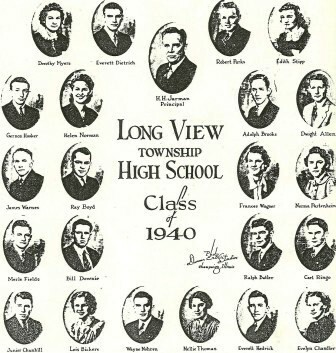 Longview Township High School "Hornets"
Longview (population 153) is located in east-central Illinois about 15 miles southeast of Champaign. Longview is located in a true country setting. 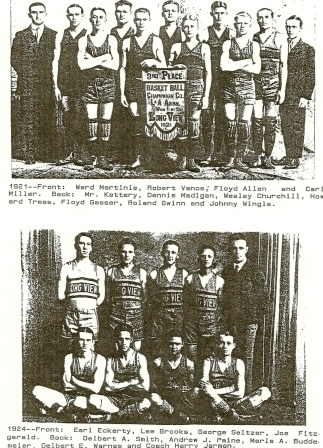 The main roads leading to the Champaign County town include County Highway 12 and County Road E 100 N. It is quite probable that Longview was one of many towns created initially by the railroads of the mid 1800s. The Missouri Pacific Railroad line still runs through Longview. 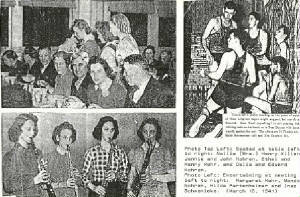 Carl Erb: Carl attended Longview High School through his junior year (1953) and graduated from ABL High School in 1954. 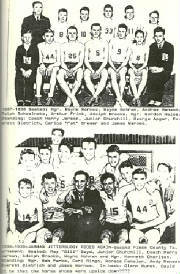 "The name of the 1949-50 yearbook was "Orizaba Stinger." 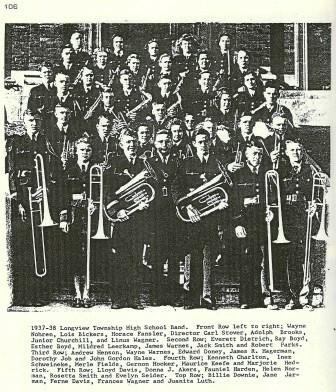 Orizaba was the settlement about 1/3 mile north of the town of Longview. When the Chicago & Eastern Illinois Railroad came through a little south of Orizaba, the Orizaba folks moved to the new town. 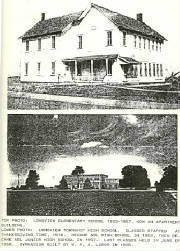 In 1889 the name of the post office was changed from Orizaba to Longview." 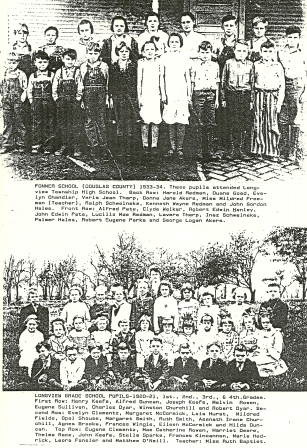 It is probable that Longview offered education to its children in the late 1800s. 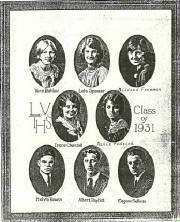 Longview probably had a high school in place by the early 1900s, maybe sooner. 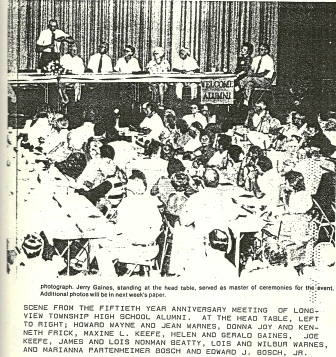 The high school served the residents of Longview proudly for about five decades. 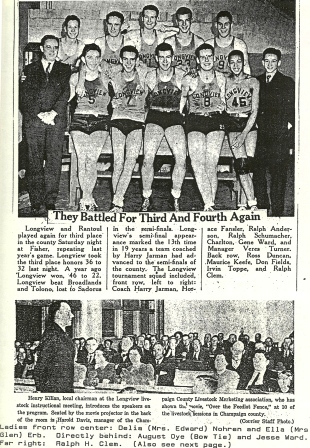 At some point in the 1950s a consolidation effort took place with three small towns of the area; Allerton, Broadlands, and Longview. 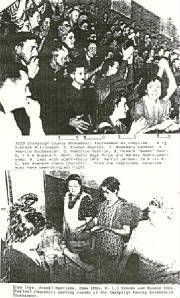 The effort resulted in the creation of the Broadlands (ABL) School District in the summer of 1953. 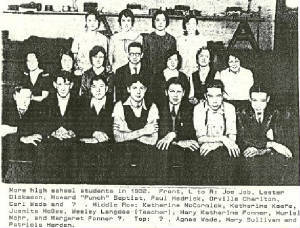 "I graduated with a class of 17 in 1952. 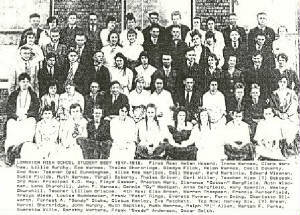 I think that there was only one more class (1953) to graduate from that building. 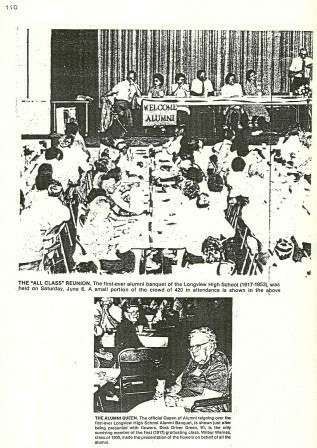 We still hold bi-annual reunions with approximately 90-100 in attendance. 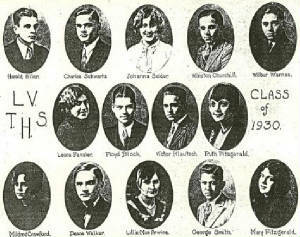 Ten classmates from '52 still live in the area. Three have passed away." "I attended ABL/Heritage school district from kindergarten through graduation – and Longview was a part of both consolidated districts. 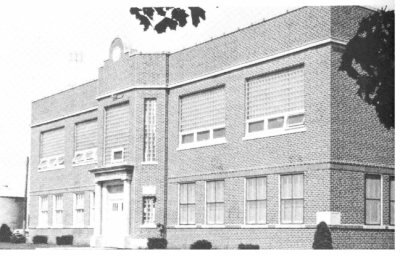 The Longview High School building has indeed been razed, but it WAS used by ABL at least from the time that I started kindergarten in 1977-78 through my graduation year of 1990 as the 5-8th grade building for the ABL district. 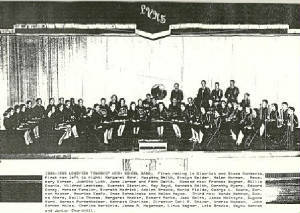 Soon after the consolidation and the formation of Heritage, the 5-8th grades moved to the Homer building, where they remain today. 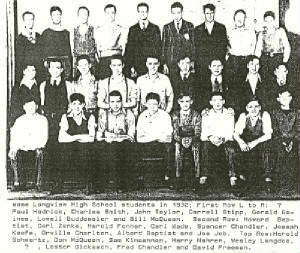 My grandmother, Wilma Messman Magill, was a graduate from Longview High school, and had many fond memories of the building." 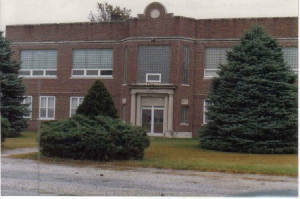 Broadlands (ABL) School District welcomed the addition of nearby Homer High School (also on this site) in 1989 and renamed the school district the Heritage School District with the high school remaining in Broadlands. 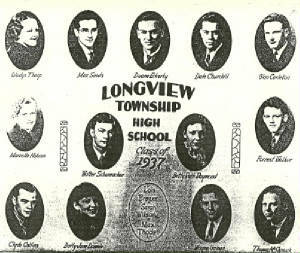 Longview HS nickname: the "Hornets"
Longview High School competed in boys basketball and most likely boys track and baseball. 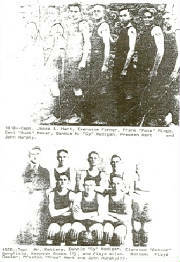 School team nickname, school colors, fight song, and conference affiliation are all items of intersets for this site. 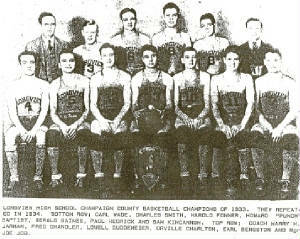 The 1930s were the "hey days" for Longview High School basketball as far as IHSA (www.ihsa.org) hardware is concerned. 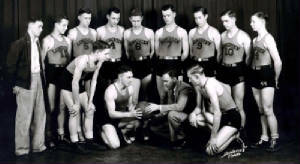 The Longview boys won three District titles in one seven year period between 1933 and 1939. 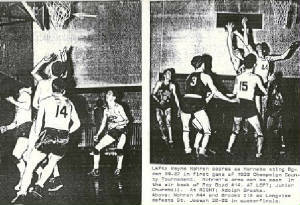 Several tournament scores are recorded aon a website titled "Illinois Postseason Basketball Scores" and are listed below. 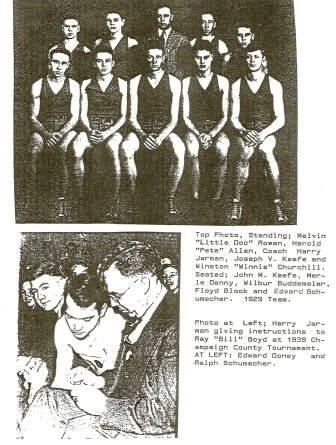 Unfortunately the coach's names and team records of these and other great Longview High teams are not currently available. CHAMPAIGN (32): Castelo 9, Kemper 7, Hodge 6, Parker 5, Smith 5.